I was making a dinosaur plush toy yesterday and just one step away from finishing it, all I need was just some stuffing and a pair of black beads for the eyes. As I didn’t want to go too far to buy supplies, I headed to a thrift store nearby. I was planning to find some broken plush toys that I can cut open to use the stuffing and eyes. Apparently the plan just didn’t work out. Erm, so I decided to call the plan off and preferred to go to a real craft store tomorrow. Anyway, I didn’t leave empty-handed. 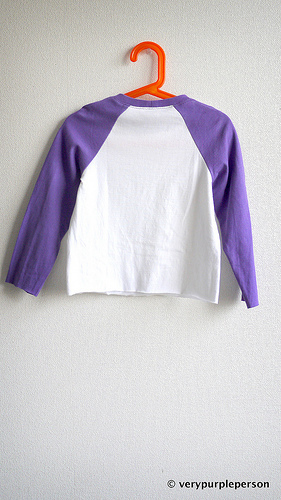 I found this men’s white and purple knit shirt with raglan sleeves that would be perfect for Sidra’s shirt. 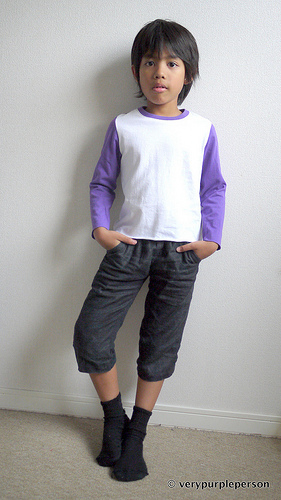 Thrifted clothes are such a good material source for kid’s clothes (and sometimes my clothes too!). 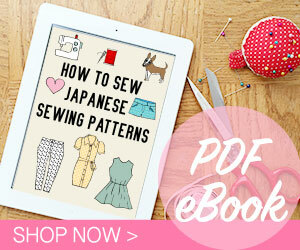 The shirt pattern is called Biscuit, I just bought it from Tamanegi Kobo. 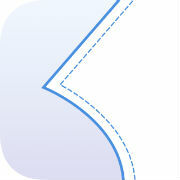 It’s pretty straightforward with only four pattern pieces. The shirt was sewed using stretch stitch on my sewing machine and the hem are left unfinished. I especially love the sleeves! 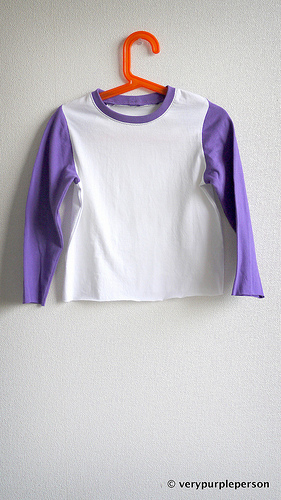 From the front, they look like ordinary sleeves. 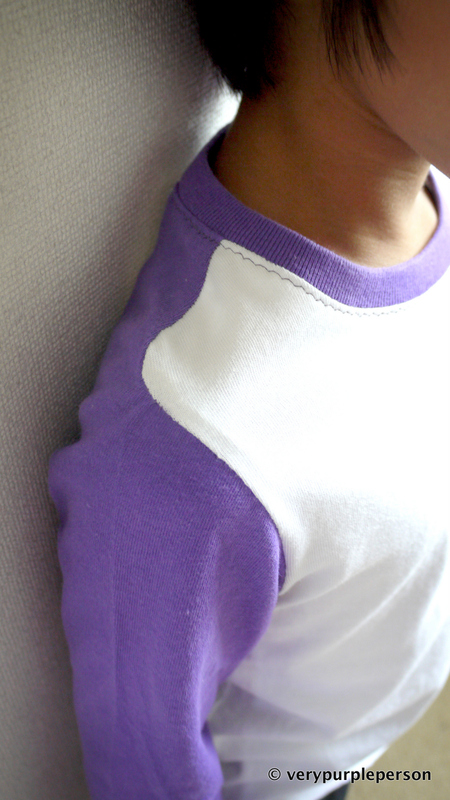 But from the back, they are raglan sleeves. How interesting! The shirt was finished just as Sidra got back from school. “Where’s my dino?” he asked as I’ve promised that the dino will be ready when he came home (he has prepared a name for it!). I presented him the shirt instead, but he didn’t seem to mind. Hmmm…? 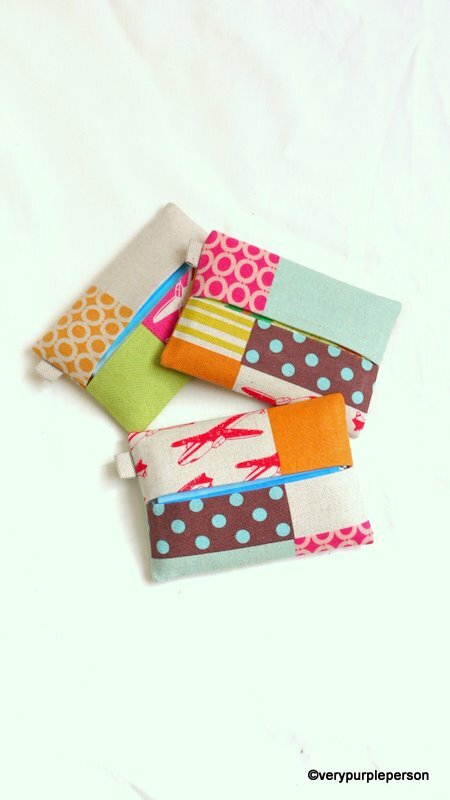 Pattern is Biscuit from Tamanegi Kobo.